ResMed’s Newly Introduced Swift FX Bella Nasal Pillow System Available at Sleep Restfully, Inc.
ResMed has recently introduced it the Swift Bella Nasal Pillow System the most innovative patient friendly CPAP mask every created. The Swift FX Bella Features a minimal design that reinforces a sense of freedom so you can look and feel more like yourself. Bella loops fit comfortably around the ears and stay out of your hair. In keeping with ResMed’s reputation as being the leader in the sleep therapy industry when it comes to CPAP machines and CPAP mask ResMed proudly introduced the Swift FX Bella Nasal Pillow CPAP Interface. The ResMed Swift FX Bella features a minimal design that reinforces a sense of freedom that offers the user more choices when it comes to customized fit and personal comfort. The ResMed Swift FX Bella offers two ways to wear the mask, depending on the user’s personal style and comfort preferences. A user can choose to use the soft silicone headgear embraces the face gently and needs minimal adjustment or the Bella loops that fit comfortably around the ears and stay out of your hair for a user-friendly way to manage different hairstyles. Although the ResMed Bella Loops were designed with her in mind many men are taking advantage of the comfort provided by this CPAP mask. Pink soft wraps provide extra defense against facial marks. 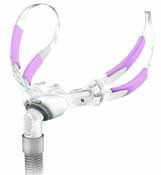 The ResMed Swift FX Bella uses the same spring-flex lightweight tube that stretches and bends uniquely for increased stability without the use of a tube retainer as the original Swift FX. Quiet vents diffuse and direct airflow quietly away from the user and bed partner. Sleep Restfully, Inc. prides itself on the high quality customer service it provides to Sleep Therapy and Oxygen customers. Their slogan, “We may not be able to match everyone’s price but no one can match our service” is exemplified by their Better Business rating of “A”. 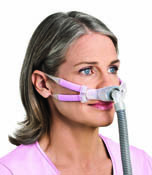 They carry a complete line of CPAP, BiPAP and VPAP machines as well as CPAP supplies by ResMed, Philips Respironics, Fisher & Paykel and other manufacturers. 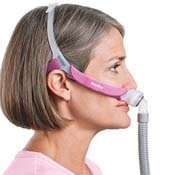 In addition to CPAP machines and CPAP supplies, Sleep Restfully is your portable oxygen concentrator specialist offering the best prices and support for portable oxygen concentrators such as the Respironics SimplyGo, Respironics EverGo, Sequal Eclipse 3, Inogen G2, Invacare XPO2 and more. They also sell stationary oxygen concentrators such as the Philips Respironics EverFlo and Invacare Perfecto. Sleep Restfully, Inc. has been chosen as an Authorized Internet Provider for the new Philips Respironics SimplyGo Portable Oxygen Concentrator.